Posh debutant Junior Morias in action at Scunthorpe. Photo: Joe Dent/theposh.com. It’s a shame resilience alone won’t guarantee promotion from League One. Posh are awash with that important characteristic. It enabled them - along with a lucky bounce off Scunthorpe defender Charlie Goode - to grab an unlikely point at Glanford Park, League One’s most impenetrable fortress, yesterday (January 2). The ball has struck Scunthorpe defender Charlie Goode and ended up in the back of his own net to give Posh a point. Photo: Joe Dent/theposh.com. Scunthorpe didn’t lose a single home game in 2016. They’d let in just seven goals before yesterday, form that had helped them lead the division for most of the current campaign. It’s hardly a testament to the force of fan power - attendances regularly drop below 4,000 - but it is a credit to efficiency, consistency and organisation. Scunthorpe aren’t particularly easy on the eye, but they are clearly hard to play against. They enjoyed two periods of dominance in this game, a 10-minute stint in the first-half when Luke McGee came to Posh’s rescue with a remarkable double-save, and a 10-minute spell at the end after Goode had diverted Michael Smith’s fine cross into his own net to give Grant McCann’s men an 84th-minute equaliser. That was the catalyst for some terrific late action, in complete contrast to the rest of the game, which saw two sides go all-out for victory. Scunthorpe had the chances though, with Jordan Clarke forcing a fine close-range stop from McGee after a superb long pass and excellent close control, before Smith and fellow full-back Andrew Hughes headed powerful goal-bound shots from Kevin van Veen and Paddy Madden off the line. There’s that resilience and a refusal to be beaten. Posh drew all three festive games 1-1, but this was the most impressive point by far. Posh goalkeeper Luke McGee is beaten by a superb free kick from Scunthorpe's Josh Morris. Photo: Joe Dent/theposh.com. And yet there is still some cause for concern at the ABAX despite a run of one defeat in 13 competitive games. Somehow Posh need to generate a greater contribution from those playing furthest forward. McCann clearly realises this. His selection yesterday suggested he hasn’t been as thrilled as he sometimes claims in post-match press conferences with the form of his strikers. 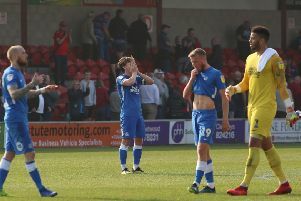 Tom Nichols was dropped to the substitutes’ bench at Glanford Park, while Shaquile Coulthirst was removed from the squad altogether, and he wasn’t injured. Instead for a game against a mean defence, Junior Morias, lately of St Albans City, was handed a full debut. He was employed up front on his own in a system McCann admitted hadn’t been worked on sufficiently, and boy did it show in the first-half. Posh substitute Lee Angol battles for the ball with Scunthorpe's Neal Bishop. Photo: Joe Dent/theposh.com. On paper McCann had selected one striker in what was still a very attacking line-up. Players who love to dribble, break at pace and shoot were shoe-horned into the starting XI, but it was a formation that flopped as, with the honourable exception of outstanding skipper Chris Forrester, possession was gifted away as soon as it had been won. Morias is an unlikely looking footballer. He’s like a squat, more muscular version of Aaron Mclean. Before the break he cut a lonely, isolated figure, but he did show glimpses of potential in the second-half when joined by Lee Angol as McCann switched to a basic 4-4-2 formation. One lovely turn past his marker was followed by an ambitious shot at goal from 20 yards. The changes would probably have been made even without a splendid free kick strike from Scunthorpe dead-ball star Josh Morris in the final minute of the first-half, one that whistled past McGee from 20 yards to give Scunthorpe a lead they deserved. Posh improved greatly without causing home goalkeeper Luke Daniels any nervous moments. Many crosses were delivered into the home penalty area, but all were repelled. Martin Samuelsen, another surprise starter, preferred trickery to crossing and usually failed apart from one late backheel which enabled substitite Leo da Silva Lopes to smash a shot at goal, unfortunately to the exact spot where Daniels was waiting. Forrester bossed central areas in the second period, while Michael Bostwick’s excellence reduced Scunthorpe’s threat considerably until that frantic finale. McGee’s late save from Clarke was good, but not as dramatic as his 30th-minute peiece of brilliance when he saved Hakeeb Adelakun’s low drive with his feet before recovering to divert Kevin van Veen’s follow-up shot from eight yards over the bar, again with a foot. Without a doubt Posh have a top-six back four and goalkeeper and a flair-filled midfield, That defence is about to be bolstered by a new recruit, but no signs yet of striker re-inforcements. Posh: Luke McGee, Michael Smith, Andrew Hughes, Michael Bostwick, Ryan Tafazolli, Chris Forrester, Martin Samuelsen, Gwion Edwards (sub Leo Da Silva Lopes, 46 mins), Marcus Maddison, Paul Taylor (sub Lee Angol, 46 mins), Junior Morias (sub Tom Nichols, 80 mins). Unused substitutes: Mark Tyler, Hayden White, Callum Chettle, Jerome Binnom-Williams. Scunthorpe: Luke Daniels, Murray Wallace, Jordan Clarke, Charlie Goode, Josh Morris, Neal Bishop, Duane Holmes (sub Stephen Dawson, 66 mins), Sam Mantom, Hakeeb Adelakun (sub Luke Williams, 55 mins), Paddy Madden, Kevin van Veen (sub Jonathan Margetts, 90 mins). Unused substitutes: Joe Anyon, Scott Wiseman, Tom Hopper, Richie Smallwood. Goals: Posh - Goode (og, 84 mins). Scunthorpe - Morris (45 mins). Cautions: Posh - Tafazolli (foul), Maddison (foul), Hughes (foul). Attendance: 4,855 (no Posh figure given, approx 500).